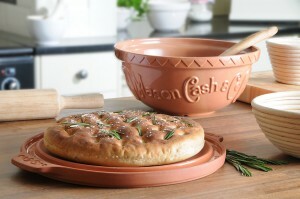 Mason Cash Bread Baking Set Award Winner and Delicious Recipe! We are pleased to announce that the new Mason Cash Bread Baking Set has been selected as a finalist at the 2nd Annual IHA Innovation Awards. There are only five key innovative product finalists within the cook and bakeware category. The ‘Best of Category’ will be announced at the International Home and Housewares Show on Saturday, March 2nd. The Mason Cash Bread Baking Set will be on display at the Pacific Merchants booth and the “New Product Showcase” area during the show for all potential new customers. Baking bread is simple with the Mason Cash Bread Baking Set, here’s one yummy recipe you can make for your family this weekend. dough. Add more flour if the dough is too wet to work. until the dough has doubled in size. out of it. Meanwhile, place the lid/baking stone into the oven and heat to 425°F/fan 400°F/Gas mark 7.
diameter. Then punch holes approximately 1.5 inches apart across the surface of your dough using your index and middle finger. greaseproof paper, cover with a clean tea towel and allow to rise for 15 to 20 minutes. until the loaf sounds hollow when you tap on its base. Using oven gloves, remove the stone and loaf from the oven allowing both to cool naturally. Drizzle with more olive oil if desired. Best served with dipping oils or butter. Posted in General | Comments Off on Mason Cash Bread Baking Set Award Winner and Delicious Recipe!